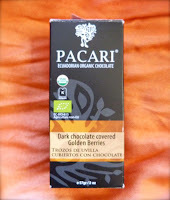 Today I took a break from dark chocolate bars from Ecuador, to sample chocolate covered golden berries from Pacari Chocolate (Ecuador). What are golden berries? Listed in Spanish as Trozos de Uvilla, perhaps they are similar to golden mulberries. I'll look forward to researching this further*, as there are many wonderful golden colored berries that grow in tropical climates. These dried berries were tasty, a bit tart, and balanced very nicely with the Pacari dark chocolate soy-free (a bit of sunflower lecithin was used instead) couverature -- made from tree-to-bar in Ecuador. *Postscript: It's more likely that these berries are similar to Poha berries (Hawaii), or Cape Gooseberries (South Africa) -- little golden orbs that resemble tiny, sweet, yellow tomatoes or tomatillos. Note: Due to travel this week, posts and photos will be delayed.